• Tim Duncan, Tony Parker, and Manu Ginobili are all expected to play when the Spurs host the Celtics tonight. The Spurs' own version of the Big Three have all played in fewer than half of San Antonio's games over the past two seasons (48 of 97). The Spurs have a 314-114 (.734) record when Duncan, Parker, and Ginobili have all played, compared to a 102-59 (.634) mark when one or more of them has been out of the lineup during that same period. 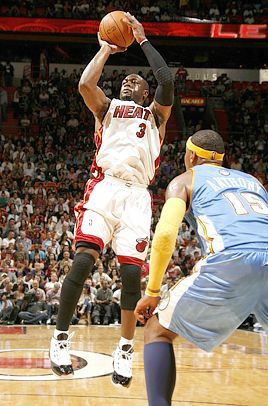 • Carmelo Anthony and Dwyane Wade, the respective third and fifth picks in the 2003 NBA draft, are the headliners when the Nuggets host the Heat tonight. Only two No. 3 picks -- Michael Jordan (14,016) and Dominique Wilkins (12,458) -- outscored Anthony (10,768) when compared over their first six seasons in the league. The only No. 5 pick to score more points over his first six seasons than Wade (9,922) was Charles Barkley (10,605). Melo was picked two spots ahead of D-Wade in the '03 draft. Who will be on top Thursday? As Celtics coach Doc Rivers recently noted, "If you've been around here enough, it sometimes felt like it took him forever to get it up. He's a gatherer, that's what we call it. He has to gather the ball to go up. You see him doing drills each day, catch and going up quick. He's doing it better." The super-helpful stats site 82games.com tracks the percentage of a player's shots that are blocked. During the 2009-10 season, Perkins has had only 10 percent of his close-range shots (not including tips and dunks) blocked, which is down five percent from 2007-08 and three percent from last season.